With her popularity at lower level, the Argentinean President, Cristina Fernandez de Kirchner, meet the most popular person in her native Argentina, next monday. She will arrive at Rome Fiumicino International Airport and will be staying, as usual, in Eden hotel, located near the Vatican. Kirchner went on Saturday at 16 of Argentina from the military sector aeroparque aboard the Tango 01, accompanied by Foreign Minister Héctor Timerman, Secretary of Worship, William Olivieri, and Public Communication Secretary Alfredo Scoccimarro . As officially reported, Monday’s meeting is scheduled for 13 in the Santa Marta residence of the Vatican, where the pope was staying, and consist of a lunch. Yesterday, Secretary of Worship, William Olivieri, forward, told Telam, the official press, that the meeting with the president to keep the Pope will be “alone already open agenda”. “The meeting will be open agenda, alone. Will talk which they consider necessary.I ‘ll Be a very good meeting because both will appreciate each other,” said Olivieri. 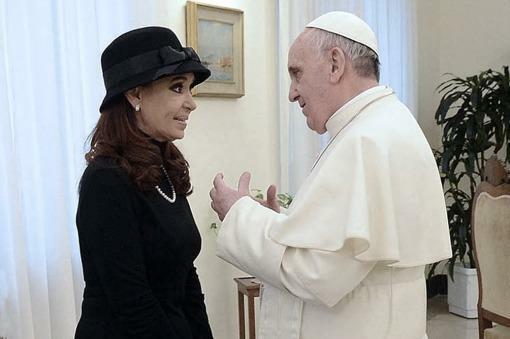 Recent polls shows Pope Frances has more than 93% of popularity among argentineans, even those are not catholics. This entry was posted in International affairs, Politics, Uncategorized and tagged Alfredo Scoccimaro, Argentina, Cristina Kirchner, Pope Frances, Telam, Vaticano, William Olivieri. Bookmark the permalink.